After a month of plenty of work I was particularly excited about a short trip to London last weekend. Staying with my sister Helena in her little cottage overlooking the Regent’s Canal always feels a little bit like going home and I had carefully scheduled my entire weekend to be able to see as many friends as physically possible in a 48h window while at the same time trying to visit at least a handful of new cafes, restaurants and bars in London. Yet in the end, my weekend in London lasted 5 days and turned out rather differently from what I had planned. When I woke up on Friday morning I noticed a slight rash on my face and upper body. A quick trip to the pharmacy during my lunch break confirmed my initial suspicion – according to the pharmacist I was likely having an allergic reaction to something. I picked up a light anti-histamine and eventually made my way to London where I met up with my sister and the lovely Mehrunnisa for dinner. Helena took one look at me and said I was not having an allergy but rather had likely contracted chicken pox, something a last minute doctor’s appointment on Saturday morning confirmed. Given how contagious chickenpox is I ended up cancelling all my plans, delayed my train back to Brussels by a few days and spent my time housebound at my sister’s place. At first I was pretty upset at not being able to see any of my friends (other than a couple of friends who had already had the chickenpox as children and who came over to keep me company). Yet in a way it was also nice to be forced to slow down for a few days. I would not wish chicken pox on anyone (the itching the first couple of days is enough to drive anyone mad), yet those days I was stuck at my sister’s place were a wonderful opportunity to catch up with Helena when she came home from work in the evenings, to read, to get some much needed sleep and just to relax, something I had not done in a long time. Nonetheless, as I slowly started to feel better I was itching to get back into the kitchen and I had cherry crumble on my mind. I think a lot of fruit is best enjoyed as is and does not particularly benefit from being fussed over. One of the few exceptions are cherries. As delicious as they are fresh I love how just a little heat is enough to release their sweet juices in abundance and and soften them just so. And as much as I love a mixed fruit crumble, at heart I prefer those crumbles made with a single fruit, letting the flavour of fruits that might only be in season for a short few weeks a year really shine. Note: I hesitate to say that the orange blossom water and mahlab are optional in this recipe as they are what transforms this cherry crumble from perfectly nice to something rather special. While cherries and orange blossom water are not a particularly common pairing they go together rather well – the orange blossom water brightening the flavour of the dark cherries. That being said, if orange blossom water and mahlab are hard to come by where you are, by all means leave them out, the crumble will still be delicious. Alternatively, you could add some ground cardamom to the crumble mixture (I would start with 2-3 pods, the seeds ground finely). I did not add any sugar to the filling as my cherries were perfectly ripe and very sweet but by all means use a couple of teaspoons of sugar if your cherries are not particularly sweet. 1. Pre-heat the oven to 200 degrees Celsius. 2. 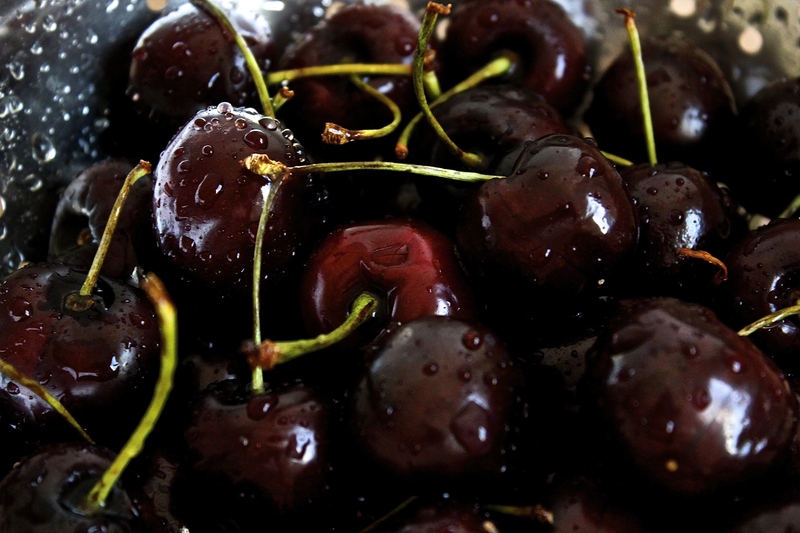 Pit the cherries and distribute evenly among two small oven-proof bowls. Sprinkle the orange blossom water over the cherries. 3. In a separate bowl whisk together the sugar, oats, mahlab and salt. Add the butter and rub into the dry ingredients until the mixture resembles sand. Scatter the crumble mixture evenly over the two bowls. 4. Place the bowls in the oven and bake for ca. 20 minutes. You want the crumble to be a deep golden colour and the juice from the cherries to bubble up through the crumble topping. 5. Leave to cool for 5 minutes before serving with a dollop of creme fraiche or yoghurt or even a scoop of vanilla ice cream. Beautiful fruit! What exceptional colour. Just waiting to see some fantastic cherries here – should be coming through soon. They have only just started appearing here as well and I am trying to make the most of the short season. I might even make a batch of jam! I’m glad you’re feeling a bit better and weren’t hit too hard by the chicken pox – it can be really nasty when you’re older. I always love your creative use of flavours and ingredients; this crumble sounds wonderful! Thank you Mehrunnisa! I really enjoyed meeting you as well and look forward to hopefully repeating this some time soon (although ideally with less discussion of any lesions on my body and my personal health history ;-)). Mahlab is wonderful – I am sure you will love it. While it can taste bitter if used too liberally, the right amounts add a wonderful flavour, similar like bitter almond. Fabulous and delicious, chicken pox, oh my. Glad you are back blogging and feeling better. Thank you Suzanne – it’s good to be back, I have missed this space!